How could our interpretations of the same film be so different? Well, my friend is Jillaine Owens, founder of Florida Gaming Development, LLC. Jill saw the movie as a story about gaming and poker. She has deep experience in the gaming industry, grew up in Las Vegas, and advocates for bringing gaming manufacturing—equipment, video, software development, etc.—into Florida. (Note: This is not the same as expanding the “retail”, or player, side of gambling. See this article by Jill to more fully understand the difference). Jill’s take on the movie Molly’s Game is reasonable given the marketing, and the fact the story is based on Molly Bloom’s reputation and criminal conviction as the “Hollywood’s Poker Princess.” Many people would look at the movie as primarily about the dark side of gambling. Indeed, if I viewed the movie’s story as principally about poker, gaming, and the inevitable involvement of organized crime, my assessment of the movie’s quality would be similar to Jill’s. I did not find the mob interface or psychology very engaging, subtle, or nuanced. Also I didn’t think Molly Bloom’s character was written with much gaming sophistication or learning about the game itself. 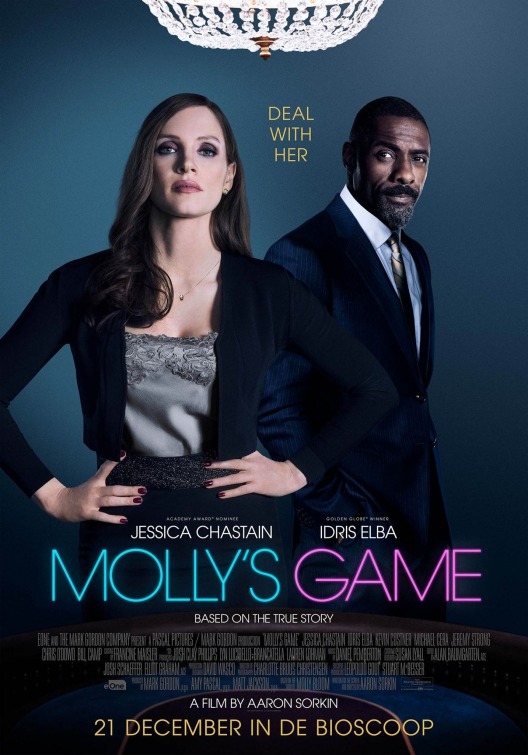 My review of the movie was based on my interpretation of story as a one about Molly’s Bloom’s “coming of age.” She entered the business of high-stakes underground poker naive, a great deal of arrogance, and without an understanding of the consequences of working and living in that world. She learns first hand harsh, brutal realities of the cutthroat nature of underground poker the hard way. In retrospect, Molly recognizes that she made several key decisions that made her poker-based life unsustainable, from the drug addition that came with the stress and responsibility for managing the game to underestimating the physical violence the Russian mob would resort to muscle in on her winnings. She ended up broke and the target of aggressive prosecution that could have landed her in prison for a decade or more. A consequence of visual storytelling (film) is that the range of interpretations of stories broadens compared to written forms (e.g., novels, short stories) where the author has a larger degree of control. The screenplay is the skeleton of the story in a movie. The story is fleshed out through a myriad of creative choices and decisions almost always made by others, including how actors interpret their roles, which scenes will be kept in and which ones will be left out through editing, the choice of the musical score to convey mood and intent, the choice of how the movie will be filmed, just to name a few. Marketing adds to the complexity because the messaging will effect people in different ways. Jill thought the movie would be about gaming strategy, or survival in the gaming industry. As someone familiar with gaming, she could also see how deeper knowledge of gaming might have also created richer interactions between the character and moved the plot forward. Paradoxically, the gaming element actually discouraged me from seeing the movie. I almost skipped it. I decided to see it after learning a few more details about the story itself, including Molly Bloom’s background. This is one reason I try to make my reviewing as transparent as possible and have a guide available to the public on my website: http://www.srstaley.com/film-reviews.html.